KOHALPUR, Oct 17: Bheri-Babai diversion multipurpose project, a national-pride project, has provided jobs to 500 Nepali youths. The youths are employed in project industry of tunnel pipe, tunnel construction, office administration and assistant-level posts. Nepali workers were earning around Rs 16,000 to 50,000 monthly along with accommodation, according to project officials. Most of the youths are from Surkhet, Banke, Bardiya, Jajarkot, and Salyan districts. Asim Chaudhary from Bardiya said that he was earning Rs 27,000 every month. If he did extra time, he earned up to Rs 37,000 every month. Almost 350 Nepali workers are working in this industry of making cemented pipe. A total of 500 Nepalis, 90 Chinese and three Russian nationals are working in this project. Li-Chyang, Babai in-charge of Chian Overseas Engineering Group (COVEC), said 500 Nepali workers are working in this project and more workers are required. 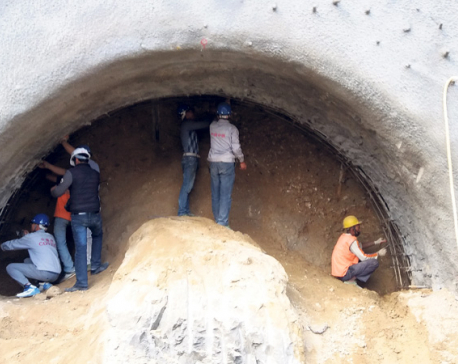 “We have provided them with free accommodation,” he said: “The work schedule is from 8 am to 12 noon and the second shift is from 2 pm to 6 pm in the evening.” Till the completion of 12-km tunnel construction every day 500 people will get job in this project, he told Republica. Currently, the tunnel is being constructed over Hattikhal of Bheriganga Municipality in Surkhet. Also, the pipe industry spread in 70 ropanis of land is being constructed over there. It will produce 5000 tunnel pipes. Every day, it produces 80 tunnel pipes at the rate of 40 each 12 hours. The contractor has targeted to construct 12-km tunnel within four years to divert water from Bheri to Babai River. 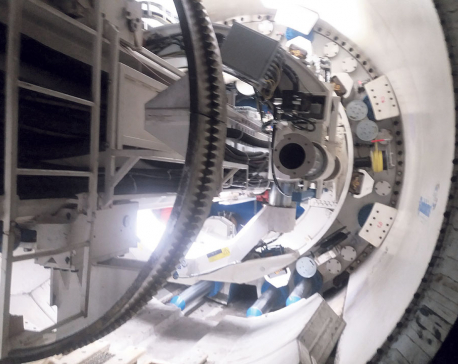 Using a TBM technology 12-km-long tunnel is being constructed at Chure hills. Among the three phases of the project, the first phase is to construct the tunnel, second is to produce 48 MW electricity, and connecting it to the national transmission line. And in the third phase, there will be the work of providing irrigation facility to 51 hectares of land in Bardiya round the year. The total investment of the project has been estimated at Rs 16 billion.